Batrachospermum sp., copyright Gary Baird. The Batrachospermales are a group of freshwater red algae characterised by uniaxial gametophytes, together with pit plugs with a domed outer cap layer but no cap membrane (Müller et al. 2002). [G03] Gnilovskaya, M. B. 2003. The oldest tissue differentiation in Precambrian (Vendian) algae. Paleontologicheskii Zhurnal 2003 (2): 92–98 (transl. Paleontological Journal 37 (2): 196–204). [HS02] Harper, J. T., & G. W. Saunders. 2002. A re-classification of the Acrochaetiales based on molecular and morphological data, and establishment of the Colaconematales ord. 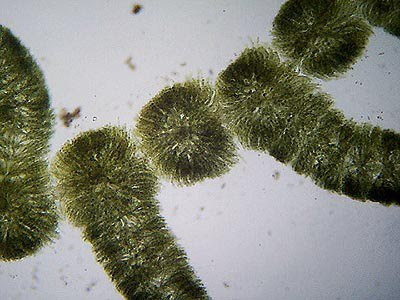 nov. (Florideophyceae, Rhodophyta). European Journal of Phycology 37: 463–476. [HB03] Harvey, A. S., S. T. Broadwater, W. J. Woelkerling & P. J. Mitrovski. 2003. Choreonema (Coralllinales, Rhodophyta): 18S rDNA phylogeny and resurrection of the Hapalidiaceae for the subfamilies Choreonematoideae, Austrolithoideae, and Melobesioideae. Journal of Phycology 39: 988–998. [MS02] Müller, K. M., A. R. Sherwood, C. M. Pueschel, R. R. Gutell & R. G. Sheath. 2002. A proposal for a new red algal order, the Thoreales. Journal of Phycology 38: 807–820.